Manage All Your Schedules and Your Operative With Our Time Planner. The Eworks Manager calendar integration allows you to see your own calendar and what you have on today’s schedule, so for example what jobs you have on and at what time. 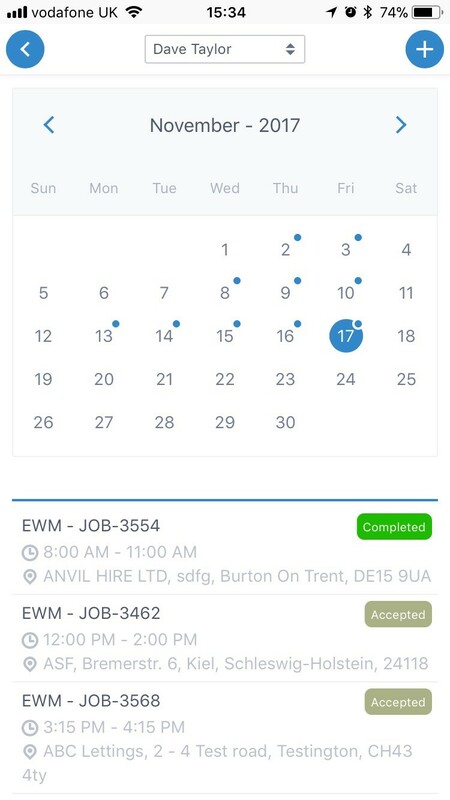 With mobile diaries, if you have permission to access, you can also see your colleague’s diaries within the app to see what they have on for the day, which is great if you need to check their availability for any reactive jobs. With this integration, you can also schedule jobs for yourself or your colleagues depending on their availability for the day or week. With this view at just a few clicks of a button within the App, you can plan, manage and time your working week effectively and manage your staff’s workload. As the My Calendar is integrated within the App, you no longer have to keep flicking back and forth from the app and your device's calendar, as you can now view everything in one place! The My Calendar feature is easy to use and simple to access so long gone are the days of rooting through endless amounts of paperwork, sat upon your dashboard to keep up with your workload for the week, as the calendar integration will allow you to see clearly where you need to be, at what time and when you are free to attend any emergency jobs that may occur. If you would like to find out more about our mobile diaries and see it for yourself then please book in an online demonstration where we can show you in depth exactly how it works and why it could help your business and staff become more efficiently organised. Or if you haven’t already, sign up today with our 14-day free trial, no contracts or payment details required!